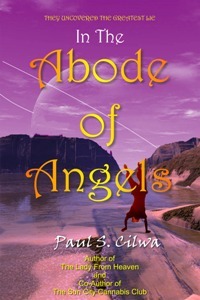 All about the world of the story of &apos;In The Abode Of Angels&apos;. In The Abode Of Angels takes place in the year 2082, and it's based on the premise that the following events happened, which places it on a world that could have been ours had just one, seemingly small, event in 2008 played out differently. 2008: US Airways Flight 1549 crashes in Manhattan in a terrorist attack; President George W. Bush declares martial law; the upcoming inauguration of president-elect Barack Obama is canceled. The next 5 years sees blatant invasions of the Middle East by the United States, with CIA torture, bribery and assassinations becoming the new normal. 2013: Google introduces Google Glass®, a device which combines the functions of computer and cell phone. The United Nations invades the U.S. to depose its dictator and restore the Constitution. A new President is elected, but a deep distrust of government has been sown. 2015: The number of missing children reaches an all-time high, prompting public demand for a version of the p-Chip, an implantable tracker for pets, which will be safe for subcutaneous implantation into children. A new startup called UniCorp introduces the s-Chip (S for "security"), an implant that allows any individual to be located anywhere on Earth. 31,000,000 units of the devices, known more popularly as the Chip, are reported pre-ordered in the weeks before the product is actually available. Clinics specializing in implantation of the devices open in nearly every strip mall. 2016: By a one-vote margin, the Supreme Court declares atheism is not a religion, and therefore not protected by the First Amendment. Many businesses promptly fire non-church-going employees, resulting in an unprecedented rise in church attendance. Asia abandons Communism and merges to become the United States of Asia. An improved version of the Chip that includes driver’s license, birth data, health data, and bank connectivity is introduced. Again, millions of units are sold and the implantation clinics maintain a brisk business. 2017: Global warming melts one too many glaciers, and the lower salinity of the oceans causes the Gulf Stream to collapse. Superstorms trigger a new ice age. Much of the surviving population of the United States flees to Mexico. Phoenix, Arizona becomes the capital of the United States. 2018: Google is purchased by UniCorp in a hostile takeover, and the Google Glass patents provide a basis for UniCorp’s Visor, sales of which outnumber hand-held smartphones for the first time. These units, worn over the eyes, combine the functions of cell phone, television, radio, hand-held video game, personal computer, Internet access, and sunglasses—and interface to the wearer’s implanted Chip. 2019: Weight redistribution on the Earth’s surface from the loss of the glaciers triggers massive earthquakes. The long-predicted "Big One" sinks most of Southern California, including Los Angeles, giving Arizona a Pacific coastline. 2020: The countries of North and South America merge to become the United States of the Americas, with the capital in Mexico City. Phoenix becomes the "New York for the New Age," the business center of the two continents, with the completion of its 200-storey World Trade Tower, now the tallest building in the world. 2024: Mathematician Emmanuel Ramos of Mexico City University, basing his work on certain unexplained phenomena discovered at CERN, publishes his Hyperspace Theory, which suggests a means of instantaneous tunneling between stars via stable wormholes. 2025: The last independent company is merged into UniCorp. Laws are passed by the United States of the Americas, the European Common Union, and the United States of Asia prohibiting any interstate business to be transacted outside of UniCorp. Africa, depopulated by the AIDS and Ebola epidemics, is annexed by the United States of Europe. 2027: The Boeing Division of UniCorp succeeds in sending an unmanned space probe through a wormhole to the Alpha Centauri system and back. Thanks to television broadcasts through the wormhole, the event is "streamed" live to most of UniCorp’s 2.5 billion employees. The presence of planets is verified, including two earthlike planets, one 91 million miles from Alpha Centauri, the other orbiting twin sun Beta Centauri. 2028: One floor of the World Trade Tower is converted to an airlock, and a wormhole to the surface of the third planet orbiting Alpha Centauri is established there. Explorers discover and contact the planet’s intelligent life, bipedal beings who call themselves the Grtth, a species that communicates verbally and uses tools and fire but lives a hunter-gatherer lifestyle. Subsequent expeditions include missionaries and sociologists, and by 2032 the long-necked Grtth have happily joined UniCorp as a wholly-owned subsidiary. 2032: A second wormhole is established in the World Trade Tower to the third planet orbiting Beta Centauri. An expedition discovers another intelligent species, the M’nar. Within five years, the new species joins UniCorp, in spite of the resistance of a few insurgents. 2036: Ten adjacent floors of the 200-storey World Trade Tower house Ramos Tunnels to other worlds. Interplanetary colonization is now an exciting possibility for UniCorp employees. Their mission: To seek out new life, introduce it to the joys of UniCorp membership, and induct it into UniCorp…whether it wants to join or not. It is now customary to implant a Chip in every newborn. 2048: The people of Earth demand, so they are told by the media, an end to independent governments and cede all ruling power to UniCorp. Although the media is owned and operated by UniCorp, no one seems to put those pieces together. May 6th, 2048, is declared the first World Corporation Day. 2052: Joshua Best is born in Mesa, Arizona. 2082: His great adventure begins.